This volume introduces three Bone cousins—Fone Bone, Phoney Bone, and Smiley Bone—after they flee from their hometown of Boneville and find themselves arriving in a strange place. After being separated, Fone Bone explores the place and makes friends with the inhabitants he meets. Fone Bone then comes across Rose, a young and attractive local girl. Fone Bone’s friendship with Rose and Granma Ben leads him to meeting his two cousins and also to an unexpected perilous adventure. In that adventure he has to deal with the silly yet nasty Rat Creatures who are looking for one of the Bones. After her hut being destroyed by the Rat Creatures, Granma Ben take Fone Bone and Rose to town because she needs to prepare for the Great Cow Race. Meanwhile, a dark force is moving in the shadow. It’s a force more powerful and dreadful than the Rat Creatures. One of the Bones is in great danger, and it all will lead into something even bigger and older. 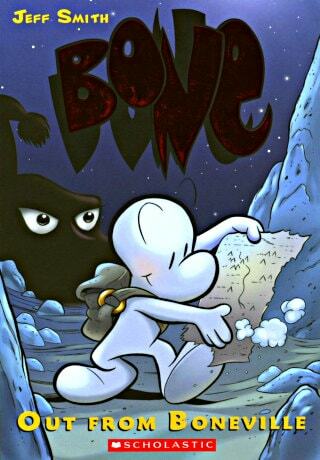 Bone 1: Out from Boneville by Jeff Smith is great opening for the amazing Bone graphic novel series. In Out from Boneville, volume 1 of this 9-book epic, the three Bone cousins — Fone Bone, Phoney Bone, and Smiley Bone — are separated and lost in a vast, uncharted desert. One by one, they find their way into a deep, forested valley filled with wonderful and terrifying creatures.Eventually, the cousins are reunited at a farmstead run by tough Gran’ma Ben and her spirited granddaughter Thorn. But little do the Bones know, there are dark forces conspiring against them, and their adventures are only just beginning!.